Exciting things are happening tomorrow. Let’s ask Wayne Swan to see just what’s going down. 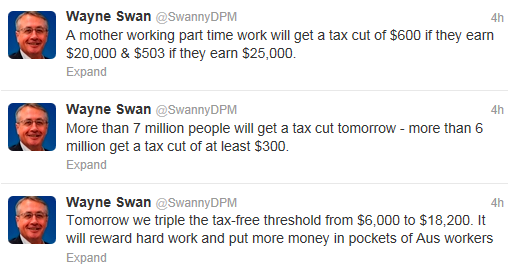 Yeah, what else is happening, Swanny? I know there are some tax cuts, but what else? Hmmm. Were they reopening the Nauru detention centre? No, they’re still too proud for that. Was it a carbon tax? Oh, that’s right, the carbon dioxide tax starts tomorrow! Now, I thought this was an important step towards a clean energy future. Surely this is more important than simple tax cuts. Maybe Wayne’s a glass-half-full kind of guy, preferring to focus on that #cashforyou. As I write this post, another one of those dreadful ‘household assistance package’ ads has come on. No mention of the carbon tax either. That’s because it’s as toxic as the alarmists make CO2 out to be. You Australians better keep high pressure on Tony Abbott and make sure he continues to promise the carbon tax will be gone if he’s elected. Politicians have a way of changing their minds the closer an election comes. He should be front and centre every day after the 1st showcasing one business a day who’s costs have to be passed on to the consumer since they will no longer be allowed to tell the truth and face a huge fine if they do. He’s saying all the right things so far, but you’re right. We need to keep him on his toes.